This is the time of year when the bike companies release details of their next year’s models — and it looks like there are some tasty new designs in the offing. Wherever you turn right now there’s a cycle manufacturer unveiling its range of all-new 2011 machines. And while this is great news for bike fanciers like us, it is also a little confusing — you hardly have time to start drooling over one piece of new kit before something else catches your attention. So, to make things a little clearer, here are some of the highlights from the burgeoning ranks of newly announced bicycles. As well as updates to the German brand’s carbon bikes — the high-end Izalco and far more affordable Cayo — there will also be an all-new, triple-butted aluminium Culebro road machine in 2011. The single Shimano Ultegra-fitted model will retail for €1,399. Meanwhile, Focus is also focusing on the smart urban market with the Planet series of bikes. All come with disc brakes, while €1,000 will buy you the almost indestructible Shimano Alfine-hubbed, Gates carbon belt-driven Planet 8. Charge Bikes has really made its mark in the short time they have been around, and 2011 looks to be another step forward for the UK company, with a raft of new models being introduced. The one that caught our eye — seemingly custom made for the average CA reader — is the Filter Mid: a satisfyingly solid, steel British bulldog of a bike, designed for cyclo-cross but equally suitable for all-year riding and commuting. With a price of £799, the Filter comes with a triple chainset and some tasteful retro mudguards. Yorkshire-based mountain-biking pioneer Pace Cycles has turned its considerable talents to the urban fixie market with the new limited edition 42:16 Street. It’s the first complete bike Pace has built for years and looks a real beauty, with custom-made parts throughout and a smart fillet-brazed steel frame. Production isand each features a unique brass identity plate. Available now and yours for £795. American bike giant Trek has a few big developments breaking through, but three in particular are worth noting. The first is that the Gary Fisher brand has been discontinued as a separate entity and now the ‘Gary Fisher Collection’ – which, to be fair, does include some quite tasty models — forms part of the main Trek line-up. Secondly there is a new Lexa range of road bikes designed especially for female riders. And thirdly, the firm’s legendary Madone top-end road racing frame has had an overhaul with the newest iteration — the Madone 6 Series SSL — being made from weapons-grade carbon-fibre. We kid you not. We have been really impressed by Felt bikes this year and the good work looks set to continue. The smart money is probably on Felt’s F75, which shares the geometry, styling and product developments of the firm’s revamped deluxe carbon machines, but being made from aluminium is far more reasonably priced, at £1,850. Meanwhile, a world away from the realm of high-speed science comes Felt’s range of stylish, simple, fixed machines — our favourite is the classy copper-finished Gridloc with its Sturmey-Archer S3X hub gear and hidden cable routing. Last year’s Tour de France-winning manufacturer has tweaked its road range for 2011. The bike Alberto Contador rode to the yellow jersey — the top-end Tarmac — has been given a new carbon fork. Meanwhile its smaller-budget brother — the hugely popular Specialized Allez range of aluminium machines — has been redesigned to provide, allegedly, 20 per cent more stiffness. 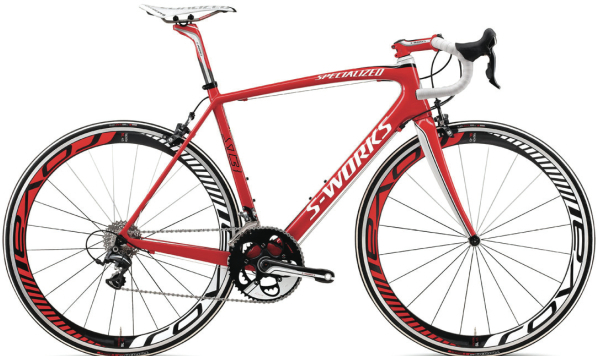 Conversely, Specialized’s Roubaix carbon frame features a range of new measures to improve comfort and all-day riding.